What is SharePoint Server for Internet Sites? SharePoint Server for Internet Sites is software that organizations license to create external Internet and/or extranet sites for their enterprise content infrastructure. What scenarios require the SharePoint Server for Internet Sites License? • No content, information, or application is accessible exclusively to individuals inside your organization. In other words, if internal users can access content, then external users must also be able to access it. • Generally, the users are not internal to your organization (i.e., individuals who are not employees, affiliates’ employees, on-site contractors, or agents serving in an employee-like capacity). • SharePoint Server for Internet Sites is licensed per running instance. • No Client Access Licenses (CALs) are required, even for authors creating content. When using SharePoint Server 2010 for Internet Sites for licensing external-facing scenarios, you must have a server license for all servers that are used to deliver content to external users, regardless of the farm configuration or whether or not users are directly accessing that server (staging, application, front-end, or index). Servers in a development/test environment are exempt from this rule assuming they are covered by MSDN® developer program licensing. The underlying logic in this is that all servers supporting a specific solution (internal vs. external and production vs. development test) must be licensed similarly (i.e., in the CAL/Server model, the per-server “For Internet Sites” model, or the MSDN developer program). This is independent of the order in which information moves through servers. What are the differences between the SharePoint Server for Internet Sites Standard and SharePoint Server for Internet Sites Enterprise? o Helps small and midsize organizations create public Internet sites or basic extranets. o Provides licensing for the same features as the Standard CAL for SharePoint Server. o When combined with active Microsoft Software Assurance, it is eligible to be stepped up to SharePoint Server for Internet Sites Enterprise for an additional fee. o Designed for enterprises to create externally-facing public Internet sites and secure private extranets using the full capabilities of SharePoint Server. o Provides licensing for all SharePoint Server features (the same as SharePoint Server Enterprise CAL). Offers the rights to host an unlimited number of sites and/or domains. What do you mean by “single site on a single domain” when referring to the restrictions of the SharePoint for Internet Sites Standard license? SharePoint Server 2010 for Internet Sites Standard can only be used to support a single site and its related subdomains on a single domain. · Single site: A single site is defined as having a single default page, such as a home page. · Single domain: A “domain” is a combination of a top-level domain (.com, .net, .org, .co.uk, etc.) with a second-level domain. Examples of different domains include: firm.com, firm.co.uk, and firm.net. Subdomains, defined as any URL prefixes noted to the left of the second-level domains, must point to a single default page to be considered part of the same domain. For example, service.firm.com and investors.firm.com are considered to be from the same domain if and only if they direct to the same default page. Server-side redirect (or server-side URL remapping) to bypass the default page by end users is not allowed under the licensing terms for SharePoint Server for Internet Sites Standard..
SharePoint Server for Internet Sites Standard cannot be used when these conditions are not met. For example, you must use SharePoint for Internet Sites Enterprise if multiple domains are pointing to the same site. Any entries in a zone file that point to the same landing page (A records, CNAMEs, or similar) count against the two variation limits. Because the licensing of SharePoint Server for Internet Sites is per running instance, you can run more than one site/domain using the Standard edition only if separate running instances are used for each site/domain and a unique license of SharePoint Server 2010 for Internet Sites Standard is allocated for each running instance. What if a single server is supporting both internal and external sites? If a single running instance of the software is used both for sites providing internal-facing content, and for sites providing external-facing content, you can assign two different server licenses to the same running instance. Keep in mind that SharePoint Server (licensing the internal-facing sites) also requires that you purchase the corresponding CALs. If SharePoint Server 2010 for Internet Sites Standard is licensed on the same running instance as SharePoint Server 2010 for internal-facing sites in the Enterprise, we recommend Software Asset Management (SAM) to help monitor and ensure license compliance. Learn More about SAM. If I have the Enterprise features activated on my farm, can I use the Standard edition to connect the farm to external users? In theory, you can use SharePoint Server for Internet Sites Standard with a farm on which the Enterprise features of SharePoint Server are activated. However, we recommend Software Asset Management (SAM) to help monitor and ensure license compliance. Learn More about SAM. How do I get FAST Search Server for Internet Sites? Microsoft® SharePoint® Server 2010 for Internet Sites, Enterprise (“FIS-E”) product includes rights to Microsoft® FAST™ Search Server 2010 for SharePoint® (“FS4SP”) for use outside the firewall. Certain restrictions apply to Service Providers, so check with your FAST Partner Account Manager for clarifications or details. This FIS-E model differs from a deployment of Microsoft® SharePoint® Server 2010 with FS4SP, which requires you to have the SharePoint Enterprise CAL (which is additive to the Standard CAL) and to purchase separate server licenses for each deployed instance of FS4SP. How can I obtain more information about specific scenarios such as multiplexing, virtualization, etc. SharePoint products allow users to create a centralized portal to store documents, and facilitate collaboration and web publishing. There are two licensing models for SharePoint servers, and the distinction between them is driven by who has access to the content, information, and applications provided by the servers. SharePoint Server 2010 is licensed with a Server / CAL model, while SharePoint Server for Internet Sites is licensed as a Specialty Server (i.e., per instance without CALs). To understand the distinction between these two products and their corresponding licensing models, we reference the following definitions and abbreviations in this document. · External Content: Content that is available to Internal and External Users (Internet / Extranet content), also referred to as “external-facing content”. No external content may be exclusive to internal users. ​SharePoint Server 2010 is required for Intranet and Extranet networks used to support Internal Content. If the content being stored and accessed is only available to Internal Users, it must be hosted on a Server licensed with SharePoint Server 2010. Furthermore, that content is only accessible by Users or Devices with a Client Access License for SharePoint Server 2010. SharePoint Server 2010 for Internet Sites is available for servers used to provide External Content—typically over the internet. If the content being stored and accessed is available to External Users, it can be hosted on a Server licensed with SharePoint Server 2010 for Internet Sites. Furthermore, users accessing that content will not require a Client Access License. · SPSFIS is restricted to External Content, but not External Users. For example, an Internal User (e.g., employee) would not require a CAL to access External Content on an instance of SPSFIS. 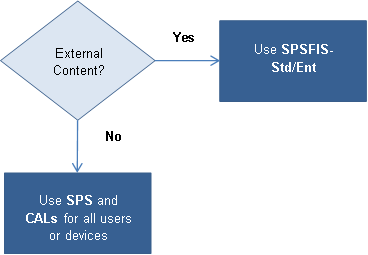 · SPS can still be used to support External Content, although each user or device requires a CAL, whether they are Internal or External. · The choice between SPS and SPSFIS for External Content is a financial one, unless the External Users have anonymous access—in which case, SPSFIS is the only feasible option. The following decision tree will help you determine which type of SharePoint Server product and license model is appropriate, based on your usage scenario. What is the difference between SharePoint Server 2010 for Internet Sites and a traditional External Connector? There are two important differences between SPSFIS and an External Connector. The first difference is based on the types of users, while the second is based on the software installed. External Connectors are licensed per server, and allow External Users to access and use a server licensed for the underlying Server / CAL product. For example, if a server is licensed for Exchange Server 2010, an External Connector can be acquired to allow External Users to maintain a mailbox on that server to be used for the business’s benefit. 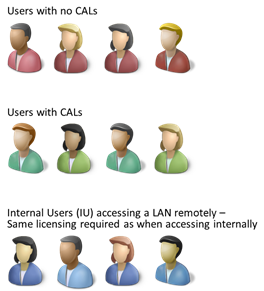 In other words, it allows External Users to access and use the licensed server without a CAL. This is important for scenarios where it is not technically or financially feasible to purchase CALs for all External Users. In contrast, SharePoint Server 2010 for Internet Sites is licensed per instance, without any CAL requirements. Server instances licensed with SPSFIS may only provide External Content; however, that content can be accessed by both Internal and External Users. This is ideal if you have external content on an internet or extranet site that is accessed by both Internal and External Users—a scenario that can only be supported by traditional External Connectors in conjunction with CALs. External Connectors are licenses that allow External Users to access the underlying server in lieu of a CAL. As such, an EC is purchased in addition to the underlying server license, where the underlying server license includes the actual server software to be installed. Put differently, there is no software associated with an EC, and it requires the underlying server license and software. In contrast, SharePoint Server 2010 for Internet Sites is licensed per server instance, and includes the rights to install an instance of SharePoint Server 2010—provided that instance is used only for External Content. Furthermore, users do not require CALs to access that content. Put differently, SPSFIS is a self-contained product because it provides the right to install and access the server software. This is particularly useful for internet applications: users with dedicated servers for External Content are only required to purchase one SharePoint license. The remainder of this document illustrates several common deployment scenarios to further explain the licensing requirements of SharePoint Server 2010 for Internet Sites. Although covered for user-based CALs, these scenarios can also be used for device-based CALs. Description: Internal Users access information through LAN or the Internet. No other users (internal or external) have access to information or applications. 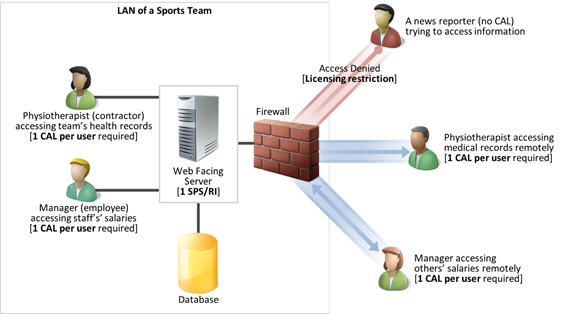 Example: A professional sports team sets up an intranet site accessed by managers, the coach, and players. It is also used for support staff such as the physiotherapist who is an on-site contractor rather than an employee. But the therapist still qualifies as an internal user. A news reporter trying to access the SharePoint site is denied access. · Licensing requirements for Server and CAL remain the same for Internal Users based on the location of access (through LAN or the Internet). Description: An organization with information accessible only by Internal Users (i.e., Internal Content) chooses to extend access to a limited number of identifiable External Users. In this case, the identifiable External Users have access to all information, previously accessible byInternal Users only. The organization may choose to license those External Users either via SPS/CAL or SPSFIS for authenticated External Users. This decision is typically made based on cost. Example: The Elm University publishes research papers, which are made available to specific educators from other universities (External Users). 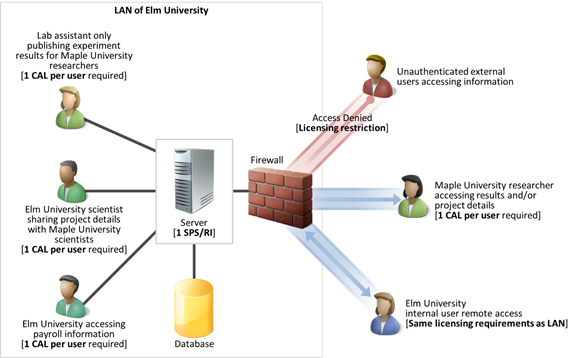 This situation is assumed to be an intranet plus extranet scenario, even though the Elm University does not have a public-facing website. · External User: No additional licenses required. • You can choose between SPS/CAL or SPSFIS based on what is more economical to them given the number of external users. • The licensing requirement for Internal User varies depending on the server license chosen and use (publishing or internal use of information/applications). • The university chooses to make External Content available to selective External Users. With SPSFIS licensing, no restriction is made on how many external users access that information. Description: Internal Users are publishing information for External Users. It is not possible to identify some or all of External Users, so you must license External Users via SPSFIS. Because Internal Users access the same information as External Users, all users can be licensed via SPSFIS, and no additional CALs are required. In another example, a team of Internal Users is customizing the look and feel of the website and testing it before the changes go live in production; CALs are not required if the Internal Users have MSDN licenses. · Test/Dev: If users are covered via MSDN, no additional server licenses/CALs are required. • SPSFIS/RI is the only license required if Internal Users are accessing the same sites as External Users. • Each staging server that is posting content requires its own SPSFIS/RI (same licensing requirement as production server). This requirement excludes test staging servers because testing technical changes are covered under MSDN. Description: You make some content available only to Internal Users, while other Content is made available to anonymous External Users. You need one SPS/RI for the Internal Content, one CAL/user for all Internal Users accessing that Internal Content, and one SPSFIS/RI for the External Content accessed by anonymous External Users. 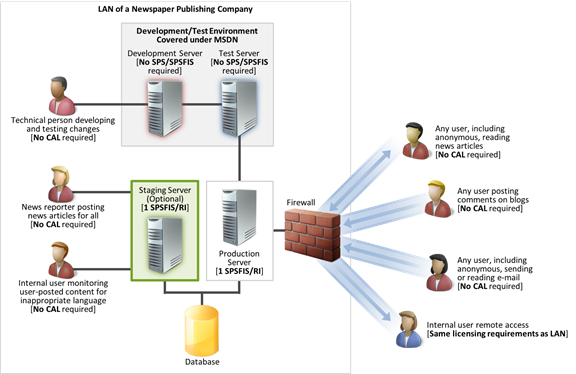 SPSFIS negates the need for CALs for Internal Users only publishing information and all External Users. Example: Woodgrove Bank offers loan information and the option to submit a loan application on its public-facing site, on which only internal users are allowed to view/work. • If Internal Users are only publishing information and SPSFIS/RI is being used for the servers, CALs are not required for them. • If the contents/information/applications accessed by Internal Users are different from those accessed by External Users, SPS/CAL licenses are required for Internal Users. Description: In this scenario, one subset of information is available only to Internal Users, another subset of information is available to both Internal Users and authenticated External Users, and a third subset of information is available to anonymous External Users. 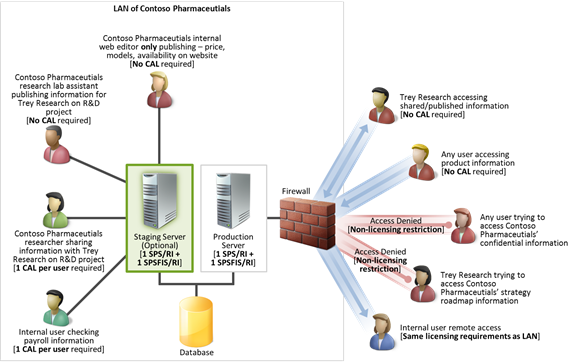 Example: Contoso Pharmaceutials maintains a public website accessible by all, offers collaboration with authenticated External Users on specific research and development projects, and hosts company’s internal intranet for its internal users. 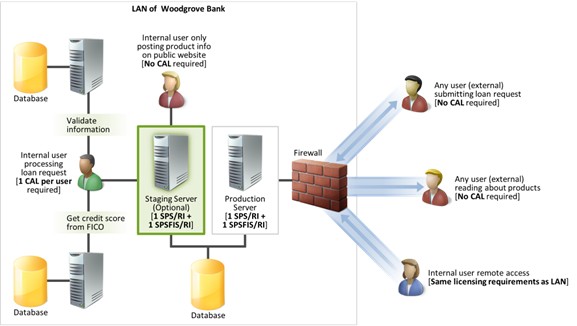 *In the case of dedicated server for extranet, users would have a choice of SPSFIS to cover all authenticated External Users or extending CALs to them, as discussed in scenario 2. · This scenario shows that the Internet plus intranet plus extranet scenario is no different than the sum of the individual scenarios. · An organization can choose to make external information available to selective external users. However, with SPSFIS licensing, no licensing restriction is made on how many external users can access external information.